HID 1326LSSMV ProxCard clamshell card, programmed with the proprietary Napco N901157A 36 bit format. Card numbers are managed by Napco and can’t be specified. No card number duplication, guaranteed. 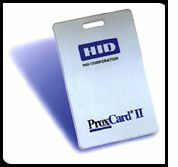 The rigid clamshell-style HID ProxCard II Proximity Access Card is approximately the size of a standard credit card, and is thin and flexible enough to be carried in a wallet or on a strap clip. The ProxCard II is not printable, but you can use a preprinted CR-79 size 10 mil PVC adhesive card. Specially formatted for use with Napco Gemini controllers. Pack of 100 cards.